State fraternal alliances (SFAs) are a mixed bag. Some provide member societies real value in terms of access to educational programs and meaningful advocacy initiatives. Others…not so much. The Alliance Board is taking a hard look at the state fraternal alliance system – in exactly the same fashion that many of our member societies are examining their local chapter networks – to better understand what makes effective SFAs tick and what, if anything, can be done to help struggling state organizations improve their performance. Over the past two months, we’ve polled both SFA leaders and member society CEOs to gain additional insight on their views about the value and viability of SFAs. And in the coming weeks, I’ll be attending no less than five SFA annual meetings from coast to coast to solicit more direct feedback on the future of state alliances from the individuals who are most involved in these organizations. Last week, I participated in the Iowa Fraternal Alliance annual meeting and was pleasantly surprised at the vibrancy and effectiveness of this state trade group. Typically (although not always), states with many domiciled societies have the most effective SFAs. Iowa is home to only one domiciled society – Western Fraternal Life Association; but two Alliance member societies (Modern Woodmen of America and Royal Neighbors of America) are headquartered right across the Mississippi River in Rock Island, Illinois, and many other societies operate in the state. A dedicated and cohesive group of volunteer leaders composed of executives and managers from Alliance member fraternal benefit societies – SFAs that have member society CEOs’ commitment to the groups’ education and advocacy goals, and the dedicated resources of society executives and managers, have the best chance at success. This is not to say that SFAs led by local chapter leaders can’t be successful, but it’s incredibly difficult to manage these complex organizations using a Rolodex and a ball point pen. The Iowa Fraternal Alliance has the type of commitment from senior executives at about a half dozen societies, which provides them the fuel to consistently conduct quality education and advocacy programs. A narrow focus on education and advocacy – The Iowa Fraternal Alliance focuses on two events each year: the spring “Day in the Statehouse,” and the fall annual meeting. The spring event brings society representatives to Des Moines for a day of meetings with state lawmakers. 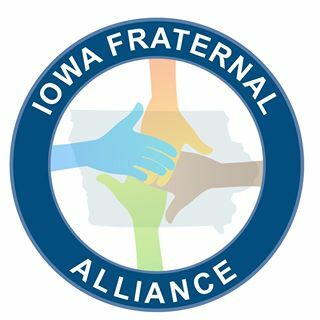 Over the years, the Iowa Fraternal Alliance has raised the profile of fraternals among policymakers and significantly contributed to the Alliance’s overall advocacy mission. In fact, two prominent state legislators attended the Iowa Fraternal Alliance annual meeting awards banquet. The annual meeting is an educational event designed to help member societies become better at both the financial and fraternal aspects of our operations. Equally important, the Iowa Fraternal Alliance does not act like a “mini-fraternal” in that it does not attempt to conduct community service projects or fundraisers that compete with the activities of its own members. A partnership with the state Fraternal Insurance Counselor chapter – The Iowa Fraternal Alliance annual meeting and the Iowa FIC chapter meeting are conducted concurrently, and it’s a partnership that benefits members of both groups. In many cases, state FIC chapters have decided to conduct their own meetings (focused on delivering educational programs that qualify for agents’ continuing education requirements) because SFA meetings were simply not valuable enough for them to attend. That’s not the case in Iowa, for the simple reason that the education programs conducted at the meeting are valuable for agents as well as fraternal executives and local chapter leaders. Thanks for coming Joe! I think the attendees appreciated the fact that you came and spoke at the meeting.